In 1935 aerial photography led to the recognition of several unusual circles in the Southern Urals steppe. It was obvious that those circles were made by humans. At that time no one could explain the origin of these circles, it was a mystery. Twenty of the spiral-shaped settlements, believed to be the original home of the Aryan people, have been identified, and there are about 50 more suspected sites. They all lie buried in a region more than 640km long near Russia's border with Kazakhstan. 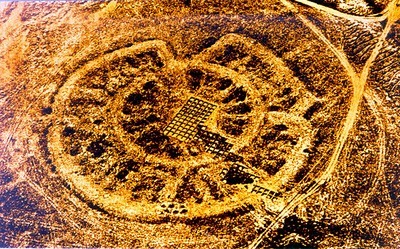 The first official sighting of Arkaim was in 1935... 'Using information derived from military aerial photography, the geologist, Batenina, identified a number of these fortresses during the 1960s. A complex of 17 fortresses was discovered in the southern Urals in the region of Magnitogorsk, Troizk, and Orenburg. Excavations have been undertaken at the settlements of Sintashta, Arkaim, Ustje, Kujsak, and others'. (Genning et al 1992: fig. 1; Zdanovich 1995; Vinogradov 1995; Malutina et al 1995). The first research on the Prehistory of Arkaim came in the same year: Batenina, T. M. 1935. Distentsionnye metody pri-ercheologicheskich issledovaniyan v sapovednike Arkaim, pp. 105–6 in Kultura drevnih narodov stepnoi Evrasii i fenomen protogorodskoi civilizacii yuzshnogo Urala 1. Chelyabinsk (“Distant methods of archaeological investigations in the Arkaim.” Culture of the ancient peoples of the Eurasian steppe and the phenomenon of proto-city civilization). (5)In 1987, Arkaim valley in the Southern Urals was going to be flooded and turned into an artificial lake. 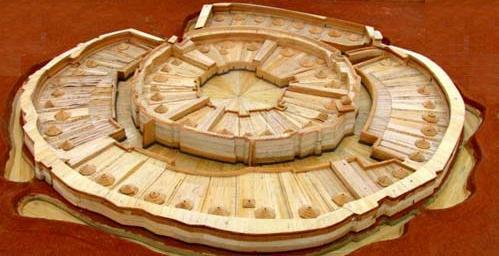 But before that would happened archaeologists were given a year to find out about the mysterious circles. When archaeologists begun to work they found out that those circles were Arkaim's settlements! It was a sensation! Arkaim is not only a settlement, but it is also a temple and an astronomic observatory! It was round and was 160 meters in diameter. It was surrounded by a ditch that was filled with water. An outside wall was very massive, the height was 5.5 meters and width was 5 meters. The wall had four gates. The largest gate was south-west gate. All the buildings were shaped in half rounds and were connected to the outside wall. Each building had exit to the main street in the city.